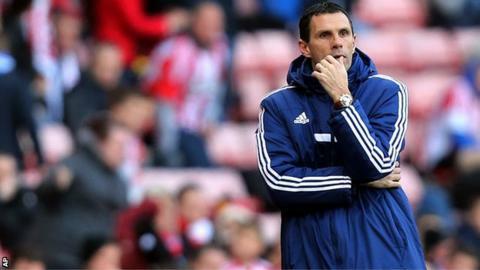 Sunderland manager Gus Poyet has dismissed rumours he is about to quit the Premier League strugglers. The Black Cats are bottom of the league and face title-chasing Manchester City at the Etihad Stadium on Wednesday. However, Poyet, 46, believes a change of manager is not the solution to the club's problems. "It looks to me that people are expecting me to walk out," Poyet said. "I don't know why they have that impression. I'm not going to quit." Sunderland. who reached the League Cup final earlier this season, are seven points from safety but have two games in hand on most of their relegation rivals. Ex-Brighton boss Poyet is the sixth manager at the Stadium of Light in less than six years. When asked if he is confident a solution can be found, he said: "I hope so. If not, we have got a massive problem. "The more solutions I find, the easier my job is going to be and I want that job to be as easy as possible." The Uruguayan also said he was not afraid of changing his own approach if that was deemed to be the root of Sunderland's poor form. "Here we are talking about solutions for the club and maybe my way is not right," he said. "If I am the problem, it would be nice if somebody told me. I have got no problem with that." After the midweek game against Manchester City, Sunderland face another title-chasing side, Chelsea, on Saturday.